Social media went nuts Wednesday, when Rolling Stone released its latest issue, the cover featuring alleged Boston Marathon bomber Dzhokhar Tsarnaev. As the day wore on, major pharmacy chains CVS, Walgreens, and Rite Aid all announced they would not carry the issue. Boston Mayor Thomas Menino wrote a letter to the magazine’s publisher condemning the glorification of terrorists and wondering why first responders and survivors didn’t make the cover. 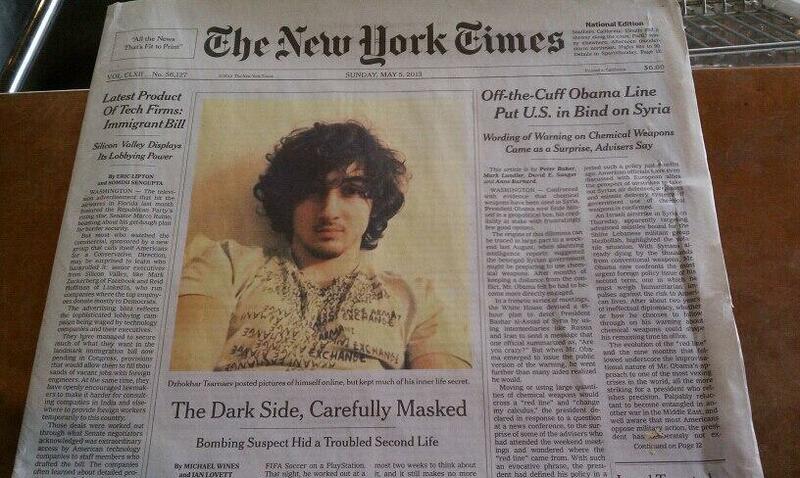 The cover refers to Tsarnaev as “The Bomber,” though he pleaded not guilty and is awaiting trial. The photo is from Tsarnaev’s Twitter account, and – let’s face it – could have just as easily been the face of a young pop star gracing the music magazine. But Boston remembers humanity as well. The three killed at the marathon; the MIT police officer killed in the lead-up to the massive manhunt; the 280 injured between the two events. In the days following the bombing, newspapers and television newscasts were filled with graphic images of victims clutching soon-to-be-amputated limbs along blood-soaked sidewalks. Seeing one of the two men responsible for that carnage on the cover of a national publication is going to stir some raw emotions. Except it didn’t in May, just three weeks after the bombing, when the New York Times ran the exact same photograph on their front page to promote a similar profile story. To reference McLuhan, is the medium truly the message? The Times is arguably the nation’s newspaper of record. Rolling Stone is thought to be a magazine for music and entertainment, though it has had plenty of significant news features in its 46 years, including Michael Hastings’ profile of Gen. Stanley McChrystal in 2010 that led to McChrystal’s resignation. They also aren’t new to putting not-so-popular faces on their cover, like this one promoting a feature story on Charles Manson. But when the title of your publication makes people think of these guys first, this second, and maybe its actual inspiration third, you wonder if misperception fuels the firestorm. After all, news magazines have been putting “evil” on their covers since before they were using photographs. Here’s Time devoting a few World War II-era covers to Adolf Hitler (their 1938 Man of the Year, no less). Here’s Time going with the Columbine shooters. Here’s Osama Bin Laden. Magazine covers use dramatic images to promote the major stories inside. We aren’t just realizing that hard news is often about bad people, are we? Rolling Stone defended its actions and directed attention to the cover story itself, saying in a statement that the profile fell “within the traditions of journalism.” The sentiment seemed to be shared by the majority of media types, who defended and even applauded the article and its presentation. 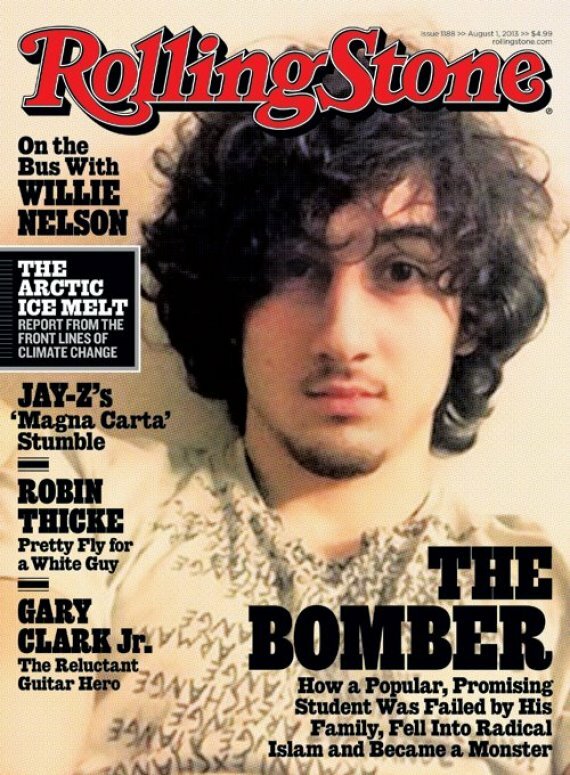 Boycotts and corporate political correctness aside, the Tsarnaev cover is going to be a winner for Rolling Stone. People will be looking for the magazine on their local newsstand… just as soon as they remember where to find a newsstand. Meanwhile, a fairly routine editorial decision has become a national story… at least for a day. In an entertainment magazine, a sharp news angle vividly reminds us in images and in words of the humanity of a villain, and the similarities between young America and a young terrorist. Facing a sea of incongruencies, perhaps we just chose not to swim. Update: One day after cover controversy, Massachusetts State Police Sgt. Sean Murphy provided Boston Magazine with photos taken the night of Dzhokhar Tsarnaev’s arrest. “Murphy wants the world to know that the Tsarnaev in the photos he took that night — defeated and barely alive, with the red dots of sniper rifles lighting up his forehead — is the real face of terrorism, not the handsome, confident young man shown on the magazine cover,” wrote editor-in-chief John Wolfson. Previous Previous post: [Video] Did ESPN commentators call Mississippians poor?